A controller is recommended by the developers to play this game. Digital Deluxe Edition also available. The Digital Deluxe Edition also includes a digital artbook and soundtrack. Replace the original file when prompted. Only works with the release version 1.0 of the game. Unity launcher, accessed by pressing ⇧ Shift when launching the game. Input tab is using placeholders only. Enabled by default. See Force exclusive fullscreen. Post-process AA is always enabled. See Post-processing. Physics are locked at low framerate. Stutter may appear above 60 fps. Open YookaLaylee64.exe with a hex editor such as HxD. Replace bytes 48 83 C4 20 and 48 83 C4 20 5B with EB 0C 90 90 and E9 39 1F F3 00. Go to offset 0xF808CC and paste write the bytes 6A 00 F3 0F 11 04 24 C7 44 24 04 DB 0F 49 40 68 00 00 34 43 C7 44 24 04 00 00 00 40 68 00 00 80 3F C7 44 24 04 39 8E E3 3F D9 44 24 10 D8 4C 24 14 D8 74 24 08 D8 74 24 0C D9 F2 D9 C9 D8 34 24 F3 0F 10 83 A0 04 00 00 0F 2F 44 24 04 F3 0F 5E 44 24 04 72 04 F3 0F 5E C0 F3 0F 11 44 24 04 D8 74 24 04 D9 C9 D9 F3 D8 4C 24 0C D8 4C 24 08 D8 74 24 14 D9 5C 24 10 F3 0F 10 44 24 10 48 83 C4 18 48 83 C4 20 5B E9 3C E0 0C FF. Change the multiplier at 0xF808E9 from 00 00 80 3F to a value representing your float value multiplier (default multiplier is 1.0). Remember to invert the byte order to Little Endian. Use this online float to hex converter. 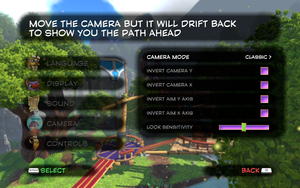 Disabling depth of field makes the graphics appear sharper and more detailed. 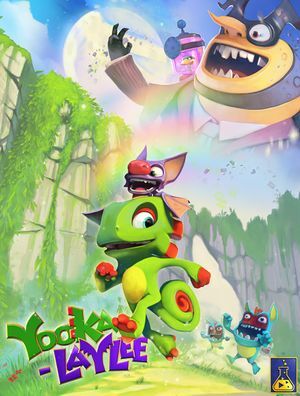 Download Yooka-Laylee 3D Vision Fix. Extract the contents to the installation folder. Press F3 to toggle the bloom effect. 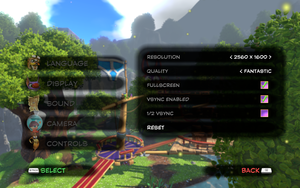 Press F4 to toggle the depth of field blur. Press F5 to toggle the post-process anti-aliasing. By default the game effects aren't modified. You can change the default state in the [Constants] section of d3dx.ini. Users with AMD GPUs need to delete the file nvapi64.dll. If no change occurs when using the hotkeys, download the current release of 3Dmigoto and use its d3d11.dll file instead. For the Steam version, select "exclusive" when starting the game to get exclusive fullscreen. 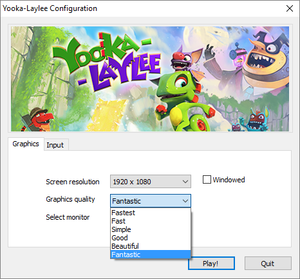 Create a shortcut to <path-to-game>\YookaLaylee64.exe. Add the -window-mode exclusive command line argument to the shortcut. Launch the game using the shortcut. Using Alt+Tab ↹ to switch to desktop may not work properly anymore. No acceleration present however mouse smoothing can't be disabled. XInput, DualShock 4 and at least known DirectInput controllers. 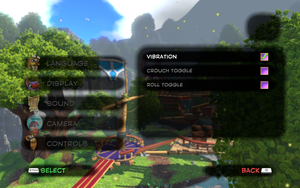 Use Playstation button prompts mod. Wireless adaptor and bluetooth untested. Restart required to hotplug or change first players controller. True for multiplayer, all hotplugged controllers are assinged for additional players. 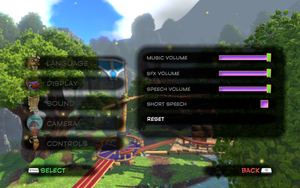 Only if the main menu is accessed with a controller (controller button prompts will be shown), otherwise the controller is used for co-op. All speech is mumble, which is always subtitled. If first player wants to use keyboard and mouse, hotplug additional controllers only after starting the game. A Controller is STRONGLY recommended to play this game. This page was last edited on 12 April 2019, at 00:25.